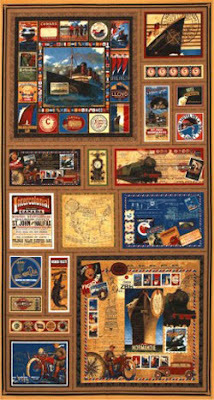 My latest inspiration is to make a memory quilt of our travels. We have visited over 50 countries and more to come. I have collected fabrics and needlework samples from a number of those countries. I want to design a quilt that features as many parts of the world as possible. I found this panel at Hancock that I'll cut up to show our love of cruising. I purchased these fabrics to supplement my stash. I appliquéd these stacking dolls to represent Russia. I want to also appliqué a maple leaf for Canada. I'll post more on my progress as I plan and start piecing. I don't want to move too fast as we have a upcoming trip to Africa in the works. What a great idea for a quilt and you're off to a roaring start. I love the dolls block.